I just realized this never posted. Sorry....I did it forever ago...back on the October 8th. 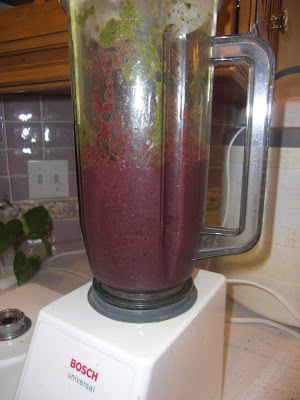 By popular demand I am posting my recipe for "Salad in a Bottle" as my husband so lovingly describes our smoothies. I swear by these to stay healthy. They kept my cold to a minimum before the marathon. A much better alternative than "Airborne" and the likes. 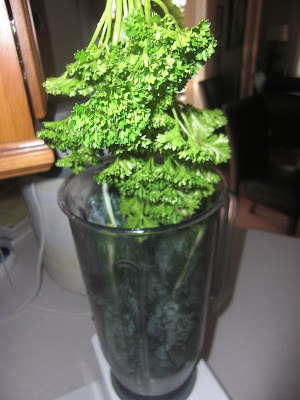 The first 2 staple ingredients kale and parsley. I love just snipping these in my garden all summer long. 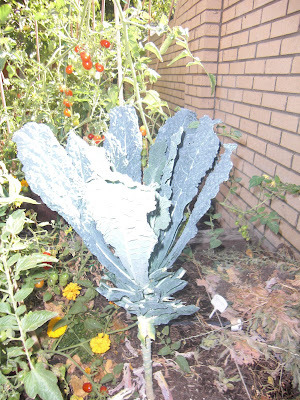 Kale is super hardy. The plant you see above actually came back from last summer. Both are very high in vitamins and minerals. Take a couple handfuls of each and wash well. Especially watch out for the little bugs on Kale. They love to hide in all the crevices of the leaves. 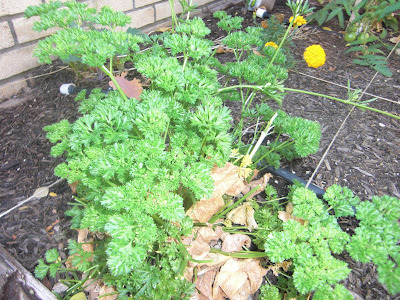 A fresh bunch of parsley. YUM. 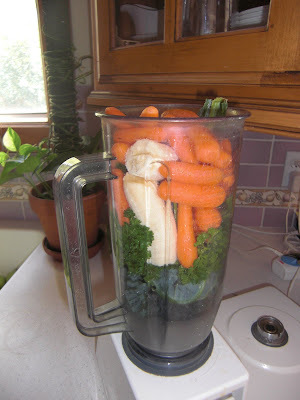 Next I added a couple handfuls of carrots and a banana. 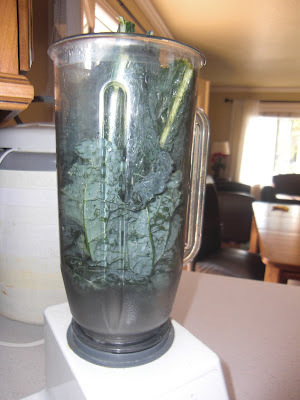 If you are having trouble getting it to blend, add a bit of water, or OJ if you prefer. 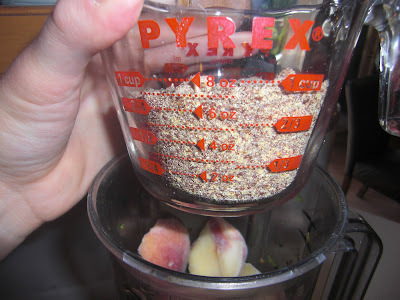 Next I put in a bunch of peaches I froze from my tree, and 3 apples from my tree. 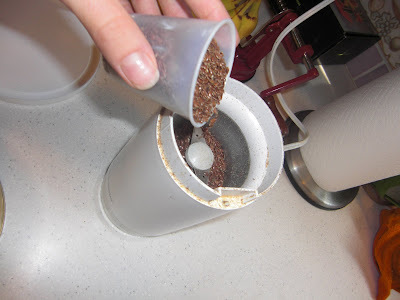 I blend 2 cupfuls of flaxseed in my coffee grinder. We like to call it the "Spice Grinder." It ends up being about 3/4 c of meal. 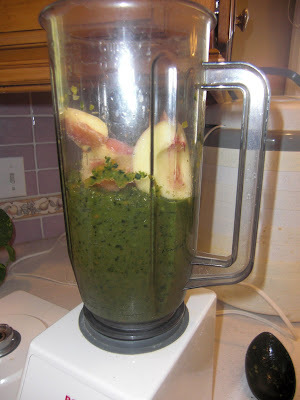 I put it directly in and blend it up! 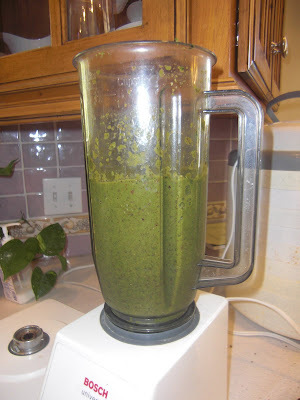 At this point, my refreshing green smoothie is complete. But of course, it needs a little doctoring for the rest of the family. I encourage you to try it green though. It is delicious. Many times I add whatever veggies I have on hand. Including lots of spinach and broccoli. Add the magic pill. The magic "purple ingredient." I wonder how the smoothie is "Disgusting. Don't like it Mom. No." when it is green. 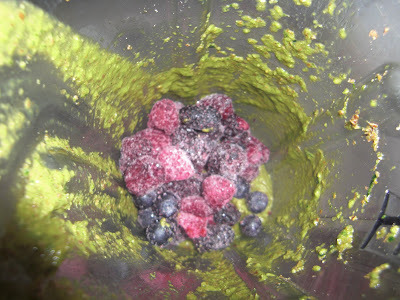 Add a few frozen berries (I get those big bags from Costco) the smoothie is purple and all of sudden "Yummy. Mmmm Mom can I have more purple smoothie?" I also sometimes add pineapple or orange juice. In the winter, I add tons of fresh oranges or clementines. My family also likes it a bit thinner than I do. The juice helps to thin it out. 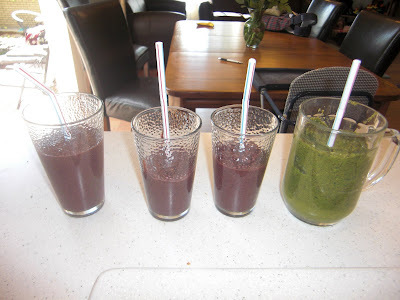 The finished smoothies. This particular batch made must enough for our family. Enjoy. Healthy Living to all!